There are over 32,000 people of all ages in Coventry providing unpaid support to a relative, friend or neighbour who cannot manage without their support and this includes children and young people. Many people don’t recognised themselves as a ‘carer’ and aren’t aware of the range of support that is available to them. 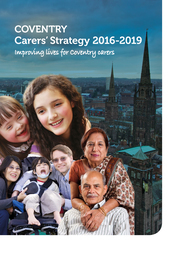 There is lots of really good work going on around the city to support carers and we want to use this bulletin to help share information that will hopefully be helpful to a wide range of people and organisations. To sign up to this monthly bulletin enter you email address in the top right hand corner. The new Carers’ Strategy was endorsed at Health and Wellbeing Board on 17 October 2016 and formally approved by Cabinet on 1 November. We are now awaiting final confirmation from all organisations involved that they are signing up to the strategy after which it will be formally launched. Overall, the aim is to get a consistent and joined up approach across Coventry to make the most of available resources. There are lots of gadgets, pieces of equipment, apps and technology that can help people live more independently and give carers peace of mind but we often find that the general public are unaware of what’s available. In partnership with the Council, Carers Trust Heart of England has started developing a “Box of Tricks” to help promote the different items that can be picked up easily on the high street or online. Visitors to the Carers’ Centre in Central Library will be able to view items on display and find out what is available and where they can be purchased. The items are also taken to carers groups and events to spread the word wider and help carers understand the potential benefits. We will keep you updated about gadgets and assistive technology with a regular feature in this Carers Bulletin. Each year Carers UK hold Carers Rights Day to bring organisations across the UK together to help carers in their local community find out about their rights and how to get the help and support they are entitled to. Making carers aware of their rights - Every year, more than 2 million people become carers. Many struggle to navigate the maze of services and entitlements, and miss out on financial and practical support. And it’s not just people who are new to caring – even those who have been caring for years sometimes aren’t aware of their entitlements. Letting carers know where to get help and support - Caring can present all kinds of challenges. We want every carer to know where to turn for advice, information and support, whether in their local community or online. Raising awareness of the needs of carers - Carers’ Rights Day raises awareness of the needs of carers with the public, employers, decision makers and professionals, helping us realise our vision of a society that respects, values and supports carers. You can download the Carers Rights Guide for free from Carers UK website. Carers Trust Heart of England will have an information stand at UHCW during the day and supporting Coventry Police to provide information to their employees who are carers. The Council will be promoting the day ensuring their employees who have caring responsibilities are aware of the policies that can support them. The 2011 census identified 5.8 million people providing unpaid care in England and Wales in 2011, approximately one 10th of the population - 3 million of which in full or part time employment. Already 90% of working carers are aged 30 plus, employees in their prime employment years. Balancing work and caring responsibilities can be difficult without the right support and 2.3 million people have given up work for caring, and nearly 3 million have reduced hours. This is not only costly for individuals but for businesses and the economy also. Carer Friendly Employers is a new scheme supporting employers in the West Midlands to support carers in their workforce. The materials include two information booklets, one for employers and one for employees with caring responsibilities. There is also a Pledge that employers can display in the workplace to promote their commitment to supporting their staff. 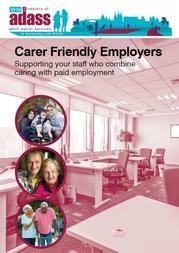 Employers can download the Carer Friendly Employers materials free of charge from the Council website. We will be organising a workshop in January 2017 for Employers to share ideas and good practice and learn about the different ways to support carers effectively in the workplace and what is available. Carers UK – national organisation.